As we had reported earlier, we are helping with a livelihood development project to help people find employment and income. Here is a photo report on the cocoa tablet manufacture. of some of the recipients and what they are doing. 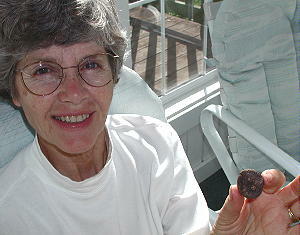 In May 2003, Mr. Serizalinio Dizon of Manila, brought us back a sample of the finished cocoa tablets (shown by Beverly Kubik) that are made and sold to be mixed with warm water and consumed. 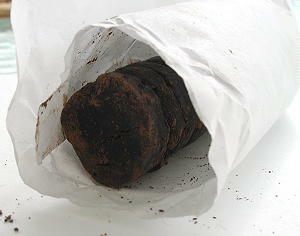 The tablets are wrapped in paper (below) and marketed. 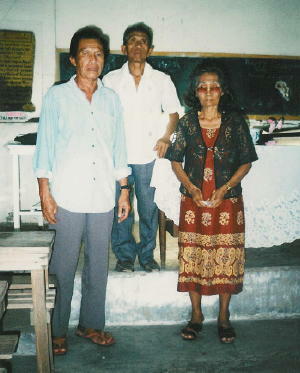 Here are three people from Sabang, Bagban Leyte who are involved in the the LifeNets Livelihood Development project. Miscellaneous work supplies: small tools, gloves, etc. We were also happy to help a young lady set up a small advertising business. She needed a computer (provided by UCG member Debbie Clark) and printer and digital camera from LifeNets. Cecile Cinco writes: "We bought a an Epson C-60 printer and a digital camera and some supplies to start the business. We're creating an ad to post at some establishments and nearby schools. Again, thank you all very much for being instruments to our wonderful blessings!" Finally, LifeNets provided $1000 for special medication.